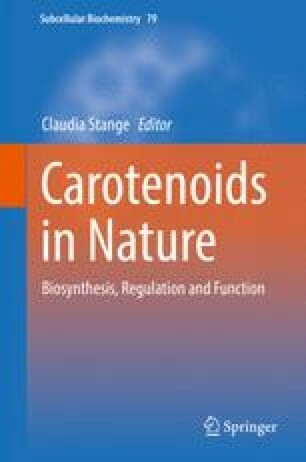 Carotenoids are precursors of carotenoid derived molecules termed apocarotenoids, which include isoprenoids with important functions in plant-environment interactions such as the attraction of pollinators and the defense against pathogens and herbivores. Apocarotenoids also include volatile aromatic compounds that act as repellents, chemoattractants, growth simulators and inhibitors, as well as the phytohormones abscisic acid and strigolactones. In plants, apocarotenoids can be found in several types of plastids (etioplast, leucoplast and chromoplast) and among different plant tissues such as flowers and roots. The structural similarity of some flower and spice isoprenoid volatile organic compounds (β-ionone and safranal) to carotenoids has led to the recent discovery of carotenoid-specific cleavage oxygenases, including carotenoid cleavage dioxygenases and 9-cis-epoxydioxygenases, which tailor and transform carotenoids into apocarotenoids. The great diversity of apocarotenoids is a consequence of the huge amount of carotenoid precursors, the variations in specific cleavage sites and the modifications after cleavage. Lycopene, β-carotene and zeaxanthin are the precursors of the main apocarotenoids described to date, which include bixin, crocin, picrocrocin, abscisic acid, strigolactone and mycorradicin. The current chapter will give rise to an overview of the biosynthesis and function of the most important apocarotenoids in plants, as well as the current knowledge about the carotenoid cleavage oxygenase enzymes involved in these biosynthetic pathways. We thank Dr. Andrew Wiszniewski for the proof-reading of this text and the Chilean Conicyt- Fondecyt 1130245 Founding.